Zinus Inc. (Sleep Revolution) deals in China-made spring and foam mattresses. The mattresses are vacuum-sealed or compressed, and expand upon opening. Zinus memory foam mattresses are in demand all over the world. The mattresses of this brand are available in an economical price range, which makes Zinus mattresses popular. Popular Zinus models include Spa sensations, Night therapy, and Vivon. These mattresses tend to be easy to move on. The feature of these mattresses to be more firm than soft can lead to a less than ideal comfort level for some side sleepers. These products have a warranty of 5-15 years. Today, we have catapulted over our competition by creating “Positional Mattresses” that change positions so people can watch TV, work on their laptops, even have breakfast in bed… in MORE COMFORT. The breakthrough innovation here is that all the moving parts are inside the mattress so owners can keep their existing furniture and experience virtually silent motor operation. Perhaps the biggest innovation in mattress comfort is our patent-pending MASSAGE INSIDE MATTRESSES using BROOKSTONE® massage modules in our Vivon Prestige line. Zinus foam mattresses are made up of three inches (7.6 cm) of low-density memory foam under which lies the base support foam. Models include Night Therapy, Spa Sensations, Sleep Master and Best Price Mattress. Zinus spring mattresses are built of five inches (12.7 cm) of regular foam and fiber over a layer of pocket coils. Models include Sleep Master, Slumber One, Spa Sensations, Night Therapy. Zinus memory foam mattresses generally have three profiles available: 8 inches (20.3 cm), 10 inches (25.4 cm) and 12 inches (30.5 cm). The 12-inch (30.5 cm) model has a 5-inch (12.7 cm) memory foam comfort layer so it’s likely that you will sink quite a bit into it. 4.5-inch (11.4 cm) comfort foam overlying a 10-inch (25.4 cm) thick mattress also can give you a considerable sinking feeling. The 8-inch (20.3 cm) model has only a 4-inch (10.2 cm) memory foam overlying it. According to customer reports, the 12-inch (30.5cm) and 10-inch (25.4 cm) mattresses are soft to medium, and the 8-inch (20.3 cm) – medium to firm. 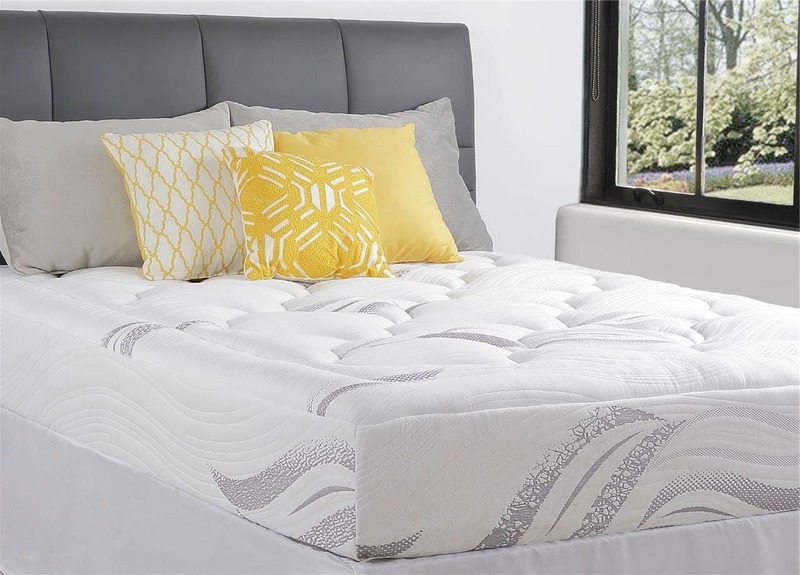 Thick memory foam layer feels snug and soft and gives a feeling of sleeping in a cloud, while the comparatively thinner memory foam layer feels firm and not quite cushy. Sleeper weight is another important aspect affecting comfort level. Heavyweight sleepers usually feel firm on the mattress with a thinner memory foam layer and soft on one with thicker foam. About 30% of Zinus mattress owners report sagging and lack of support after three years of use in comparison to about 20% of memory foam mattress owners. As a result, spring models are perhaps best suited for child use or temporary, occasional adult use. Zinus mattresses have a price range of $150-$700, depending on the make, model and size (addition of optional frame or foundation may increase the cost by $100- $250). Upon entering the mattress business, Zinus increased the competition that had already been very fierce, due to its low-priced products. Zinus offers a 12-inch (30.5 cm) Queen-size memory foam mattress under $300. Very few companies can give that offer. As they work factory-direct and don’t allow for much budget for marketing or promotion, they can afford reducing their prices to a great extent. Paying $200 or $300 for a good quality memory foam mattress is a pretty fair deal. Memory foam models by Zinus may sometimes cause back pain, mainly due to softening support. Foam mattress conforms to the curves or contours of a sleeper’s body, leading to above-average pressure point relief. However, excessive firmness and pressure may cause pain to about 15% of owners. Zinus provides a 5 to 15-year warranty for memory foam mattresses. Zinus mattress retailers offer at least a 30-day return period. Price refunds are possible. Ultra-low price mattresses, which makes them rather budget-friendly. A wide range of models to select from. No significant odor or off-gassing. Zinus memory foam models consist of gel-infused foam, which allows you to sleep about 30% cooler than with regular foam. Mattresses from this brand keep motion localized to a considerable degree resulting in couple friendliness. Claims made by Zinus about their products are essentially true, with limited hyperbole. Not fairly significant support for bulky sleepers and couples. As the mattress wears out with time, the sleeper (particularly heavy weight individuals) may sink far into the mattress, which can make mobility and getting up off the bed a bit difficult. These mattresses are not recommended for belly sleepers. They may be too firm to feel comfortable on for about 25% of stomach or front sleepers.